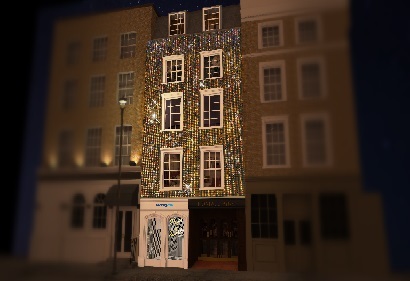 Booking.com, the global leader in connecting travelers with the widest choice of incredible places to stay, has teamed up with internationally renowned designer and sparkle champion, Christian Cowan, to create the world’s most sparkly townhouse, the ‘House of Sparkle’. Just in time for the holiday season and located in the fashion hotspot of Soho in central London, House of Sparkle has been designed for Booking.com by Christian Cowan who has famously dressed the likes of Beyoncé, Cardi B and Lady Gaga, and is renowned for bringing fun to the fashion world with copious amounts of color, glitz and glamour. Everything from floor to ceiling, including the bedroom, bathroom, closet, dining and lounge area in the four storey, custom-designed townhouse will celebrate all that sparkles. The accommodation embraces ebullience, opulence and shimmer – all said to be emergent fashion trends this season – with a gold glittery frontage, black and white checkerboard glitter entrance hall and twisted glittery rainbow stairwell. Available for booking on Booking.com and accommodating up to two guests, those lucky enough to book a stay for the night will be immersed in a sparkle experience. Guests will be able to relax in a lounge dipped in pink glitter or shower in a bathroom amongst blue glittery clouds with giant silver sequin rain installations. A curtain of metallic streamers leads guests into the master bedroom, to a party sparkly world of metallic pinata textures, disco balls and mirror details. games to get guests in the festive spirit. A selection of Christian Cowan clothes will be available to try on and a makeover station full of the latest shimmery products ensures guests will be given the full glitter experience. More, is definitely more! Priced at just £99 per night, this unique, overnight experience is available for just three x1 night stays (x2 people per night) on the 7th, 8th and 9th December. Located at 19 Greek Street, London, W1D 4DT the House of Sparkle will open bookings for its 7th December stay on 22nd November at 10 a.m. GMT, with the stays for 8th and 9th December availability being released at 3.30pm IST on the 27th November and 3rd December respectively.